Class Action’s Race/Class Intersections Program aims to create new understandings of the intersections between race and class, and provide strategies to help people of color respond to classism within and beyond their communities. Visit the program page for additional resources and upcoming programs. African American Policy Forum – connecting academics, activists and policymakers in the United States and internationally – is focused on transforming public discourse and policy to dismantle structural inequality. The think tank utilizes new ideas and innovative perspectives to promote a vision of racial justice that embraces the intersections of race, gender, class and the array of barriers that disempower those who are marginalized in society. Black Lives Matter was created in 2012 after Trayvon Martin’s murderer, George Zimmerman, was acquitted for his crime, and dead 17-year old Trayvon was post-humously placed on trial for his own murder. Rooted in the experiences of Black people in this country who actively resist our de-humanization, #BlackLivesMatter is a call to action and a response to the virulent anti-Black racism that permeates our society.Black Lives Matter is a unique contribution that goes beyond extrajudicial killings of Black people by police and vigilantes. Center for Third World Organizing is a national training center working for the creation of organizations that enable low income people of color to change society from their own perspectives. Community Change (CCI) is a non-profit organization with a particular focus on systemic racism. They are committed to serving as a center for action and collaboration among individuals and multiracial grassroots groups in the fight to achieve racial justice and equity. Good links off their web site. INCITE! is a nationwide network of radical feminists of color working to end violence against women, gender non-conforming, and trans people of color, and our communities. We support each other through direct action, critical dialogue and grassroots organizing. Institute on Race and Poverty at the University of Minnesota Law School aims to share the latest and most relevant information on issues confronting communities facing the combined challenges of race and poverty. Leadership Conference on Civil Rights (LCCR) was founded in 1950 and is the nation’s premier civil rights coalition, and has coordinated the national legislative campaign on behalf of every major civil rights law since 1957. LCCR consists of more than 180 national organizations, representing persons of color, women, children, labor unions, individuals with disabilities, older Americans, major religious groups, gays and lesbians and civil liberties and human rights groups. Its mission: to promote the enactment and enforcement of effective civil rights legislation and policy. National Council of La Raza (NCLA) is the largest national constituency-based Hispanic organization and the leading voice in Washington, DC for the Hispanic community. Their purpose is to reduce poverty and discrimination and improve life opportunities for Hispanic Americans. Their site has great links to research and statistics on Latino-Americans and 300 local affiliated organizations. National Network for Immigrant and Refugee Rights (NNIRR) is a national organization composed of local coalitions and immigrant, refugee, community, religious, civil rights and labor organizations and activists. Web site includes links to dozens of immigrant resource organizations. Poverty Race Research Action Council (PRRAC) is a non-partisan, national, not-for-profit organization convened by major civil rights, civil liberties and anti-poverty groups. Their purpose is to link social science research to advocacy work in order to address problems at the intersection of race and poverty. Race Forward is a public policy, educational and research institute whose work emphasizes issues of race and social change. Race Forward publishes Colorlines Magazine, an award-winning magazine on race, culture and organizing. Racial Wealth Divide project of United for a Fair Economy aims to deepen the understanding and analysis about the historical and contemporary barriers to wealth creation and its negative impact on society. The project lifts up the importance of wealth and wealth-building strategies among communities struggling to attain economic equality and develops and offers resources – such as workshops, publications, data, policy initiatives, and community empowerment strategies – for community leaders, activists, organizations, media, and the public at large. Raising Race Conscious Children is a resource for parents to talk about race with young children. The primary purpose of Raising Race Conscious Children is to support parents who are trying to talk about race and diversity with young children. The goal of these conversations is to prepare young people to work toward racial justice. Race Matters: A toolkit designed to help decision-makers, advocates, and elected officials get better results in their work by providing equitable opportunities for all. The approach described in the toolkit deals specifically with policies and practices that contribute to inequitable outcomes for children, families, and communities. The toolkit presents a specific point of view on addressing unequal opportunities by race and simple, results-oriented steps to help you achieve your goals. Documentary and Background Readings: “A Long History of Racial Preferences – For Whites” by Larry Adelman, executive producer of the 2003 PBS Series “RACE – The Power of an Illusion.” What we don’t readily acknowledge is that racial preferences have a long, institutional history in this country – a white history. Here are a few ways in which government programs and practices have channeled wealth and opportunities to white people at the expense of others. Adams, Rebecca, Brewer, Rose, Leondar-Wright, Betsy, Lui, Meizhu and Robles, Barbara with United for a Fair Economy. The Color of Wealth: How Government Actions Widen the Racial Wealth Divide. New York: The New Press, 2005. Amott, Teresa and Julie Matthaei. Race Gender and Work: A Multicultural Economic History of the Women in the United States. Boston, MA: South End Press, 1991. Anderson, Claud. Black Labor White Wealth: The Search for Power and Economic Justice. Edgewood, MD: Duncan & Duncan, 1994. Anthias, Floya and Nira Yuval-Davis (in association with Harriet Cain). 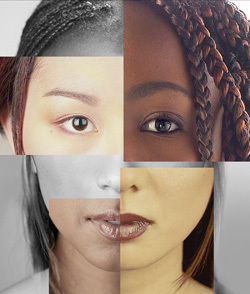 Racialized Boundaries: Race, Nation, Gender, Colour and Class and the Anti-Racist Struggle. New York: Routledge, 1993. Aries, Elizabeth. Race and Class Matters at an Elite College. Philadelphia: Temple University Press, 2008. Aries, Elizabeth. Speaking of Race and Class: The Student Experience at an Elite College. Philadelphia: Temple University Press, 2012. Bell, Derrick. Faces at the Bottom of the Well: The Permanance of Racism. New York: HarperCollins, 1992. Butsch, Richard. “Ralph, Fred, Archie and Homer: Why Television Keeps Recreating the White Male Working- Class Buffoon,” in Gail Dines and Jean M. Humez (eds) Gender, Race and Class in Media: A Text-Reader. Russell Sage, 1995. Carnoy, Martin. Faded Dreams: The Politics and Economics of Race in America. New York: Cambridge University Press, 1994. Cole, Harriette. How To Be: Contemporary Etiquette for African Americans. New York: Simon and Schuster, 1999. Conley, Dalton. Being Black, Living in the Red: Race, Wealth and Social Policy. Los Angeles and Berkeley: University of California Press, 1999. Davis, Angela: Women, Race and Class. New York: Vintage Books, 1983. Deloria, Vine and Clifford M. Lytle. The Nations Within: Past and Future of American Sovereignty. Austin: University of Texas Press, 1984. Espiritu, Yen Le. Asian American Women and Men. Thousand Oaks, CA: Sage Publications, 1997. Feagin, Joe R. Racist America: Roots, Current Realities, & Future Reparations. New York: Routledge, 2001. Feagin, Joe R and Vera, Herman. White Racism: The Basics. New York: Routledge, 1995. Franklin, Raymond S. Shadows of Race and Class. Minneapolis: University of Minnesota Press, 1991. Gilbert, Charlene and Quinn Eli. Homecoming: The Story of African-American Farmers. Boston: Beacon Press, 2000. Glenn, Evelyn Nakano. Unequal Freedom: How Race and Gender Shaped American Citizenship and Labor. Harvard University Press, 2002. Goldfield, Michael. The Color of Politics: Race and the Mainspring of American Politics. New York: New Press, 1997. Gonzalez, Juan. Harvest of Empire: A History of Latinos in America. New York: Viking Press, 2000. Gose, Ellis. Color-Blind (seeing beyond race in a race-obsessed world). New York: Harper Collins, 1997. Graham, Lawrence Otis. Our Kind of People, Inside America’s Black Upper Class. New York: Harper Collins Perennial, 2000. Graham spent six years researching the history of the African-American upper crust and this book is both a thorough work of social history and a thoughtful appraisal of his own place in the black social hierarchy. Greenwood, Janette Thomas. Bittersweet Legacy: The Black and White “Better Classes” in Charlotte, 1850-1910. The University of North Carolina Press, 2001. Hartman, Chester, ed. Double Exposure: Poverty and Race in America. Armonk, New York: M.E. Sharpe, 1997. Hooks, Bell. Where We Stand: Class Matters. New York: Routledge, 2000. James, Joy and Farmer, Ruth, eds. Spirit, Space and Survival: African American Women in(White) Academe. New York: Routledge, 1993. Jennings, James, ed. Blacks, Latinos, and Asians in Urban America: Status and Prospects for Politics and Activism. Praeger, 1994. Marable, Manning. How Capitalism Underdeveloped Black America. 2nd Ed. Cambridge, MA: South End Press, 2000. Martinez, Elizabeth. De Colores Means All of Us: Latina Views for a Multi-Colored Century. Cambridge, MA: South End Press, 1998. Menchaca, Martha. Recovering History, Constructing Race: The Indian, Black, and White Roots of Mexican Americans. Austin, TX: University of Texas Press, 2002. Moss, Kirby. The Color of Class: Poor Whites and the Paradox of Privilege. University of Pensylvania Press, 2003. Oliver, Melvin L. and Shapiro, Thomas M. Black Wealth/White Wealth: A New Perspective on Racial Inequality. New York: Routledge, 1995. Robinson, Randall. The Debt: What America Owes Blacks. New York: Dutton, 2000. Parker, Gwendolyn M. Trespassing: My Sojourn in the Halls of Privilege. Boston: Houghton Mifflin, 1997. Parker tells her story of growing up in Durham, NC, descendent of the founder of the country’s premier black-owned insurance company –and her sojourn to an elite private school and into the higher reaches of corporate America. Rodriguez, Richard. Hunger of Memory: The Education of Richard Rodriguez. Bantam. 1983. Roediger, David. Toward the Abolition of Whiteness. London: Verso, 1994. Rymer, Russ. American Beach: How Progress Robbed a Black Town (and Nation) of History, Wealth, and Power. New York: Harper, 2000. Shapiro, Thomas. The Hidden Cost of Being African American: How Wealth Perpetuates Inequality. Oxford University Press, 2004. Takaki, R. A Different Mirror: A History of Multicultural America. Boston, MA: Little, Brown and Co.,1993. Thompson, Becky. A Promise and a Way of Life: White Anti-Racist Activism. University of Minnesota, 2001. A white woman’s insights into white privilege and interviews with leading white anti-racist activists. Wilson, William Julius. The Bridge Over the Racial Divide: Rising Inequality and CoalitionPolitics. Berkeley: University of California Press, 1999. Ware, Vron. Beyond the Pale: White Women, Racism and History. London: Verson, 1992. Wray, Matt and Newitz, Annalee, ed. White Trash: Race and Class in America. New York: Routledge, 1997.